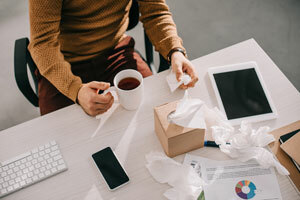 The United States Environmental Protection Agency (EPA) defines sick building syndrome as “a condition in which building occupants experience acute health and comfort effects that appear to be linked to time spent in buildings, but no specific illness or cause can be identified.” According to the EPA’s National Human Activity Pattern Survey (NHAPS), Americans spend an average of 87% of their time indoors, 6% in a vehicle, and 7% outdoors, which equals out to just under 12 hours spent outside in a given week. All of this time spent indoors in a poorly controlled environment can lead to sick building syndrome. Insufficient or polluted outside air, and poor filtration of internal air, can greatly reduce a building’s air quality. CO, CO2, and other organic compounds can be emitted from heating equipment. Volatile organic compounds (VOCs) can be emitted into the air from carpeting, copy machines, and cleaning supplies. Copy machines and printers can emit ozone while they are in use. Mold, bacteria, and viruses can develop in standing water that has accumulated in ducts, humidifiers, and drain pans. How can you resolve sick building syndrome? 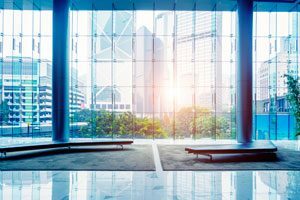 In order to resolve and further prevent sick building syndrome, precautions should be taken and an action plan put into place. Begin by cleaning ducts, floors, and any damp areas to return them to a clean slate. Next, schedule routine HVAC maintenance and monitor the indoor air quality. This will allow you to stop potential issues as they develop. Additionally, plants can be used to help naturally clean indoor air by reducing CO2, pollutants such as benzene and NO2, and airborne dust levels. 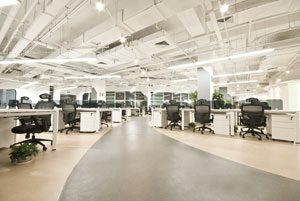 Indoor air quality (IAQ) can affect the health and productivity of employees and building occupants. It’s important to do all you can to prevent sick building syndrome and ensure the safety of everyone involved. 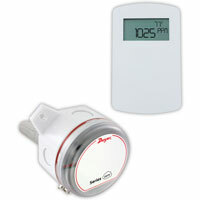 Dwyer Instruments, Inc. offers a variety of IAQ monitoring products to help prevent sick building syndrome. The Carbon Dioxide/Volatile Organic Compound Transmitter, Series CDTV, senses both CO2 and volatile organic compounds (VOC), allowing it to detect fumes that may need to be exhausted in lower occupancy periods. For maintenance checks, the Handheld Flue Gas Combustion Analyzer, Model 1207A, allows users to monitor four parameters simultaneously, including CO, CO2, natural gas, and propane. 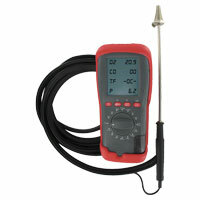 To learn about the other air quality instrumentation that Dwyer offers, please visit our website. Previous PostPrevious Ask the Expert: When should I choose a solid state relay over an electromechanical relay?